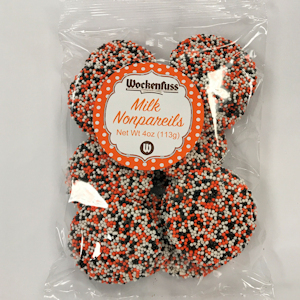 Our fall nonpareils are an excellent treat! Fall brings a chill in the air, the changing of leaves, and most importantly, a great opportunity to eat candy! From classics with which you may be familiar to candies that may be new to you, there are a lot of options. Recently we even took a look at a few of our candies and chocolates that are perfect for fall. However, there are so many sweets that we couldn’t do just one list! Here are five more of our candies and chocolates that are sure to satisfy your sweet tooth this fall. Our caramel apples start with a delicious Granny Smith apple topped with our creamy caramel. Then it’s up to you to choose your topping! We offer several caramel apple flavors, including Oreo, Milk Chocolate, Dark Chocolate, and Peanut Butter Explosion (to name just a few). Or you could just go with a classic caramel apple – you simply can’t go wrong with this treat. Candy corn is probably the candy most linked to the fall season, and we offer this classic treat here at Wockenfuss. Pick up some by the pound today so you can keep your home stocked with candy corn all season long! Usually, when people think of fudge, they think of chocolate. However, at Wockenfuss we offer a wide variety of fudge flavors – even pumpkin pie! Pumpkin pie is one of fall’s most essential desserts, and we have a fudge that has the same satisfying taste. Our creamy, delicious pumpkin pie fudge is available by the pound and is an excellent option for your fall sweets needs. A fall twist on a Wockenfuss favorite, these sweets combine pumpkin flavor with our truffles’ rich chocolate ganache and outer shell, creating an unbelievable taste. Pick up a 6 piece box today! Whether you like milk chocolate, dark chocolate, or a combination of the two, you’ll love our Autumn Nonpareils. Topped with festive orange, black, and white colors, these candies are sure to add some fall flair. business creating the finest confections in Baltimore, Maryland. With our nine convenient locations throughout Maryland, there is sure to be a Wockenfuss store near you. Come and visit us to see our selection of fall favorites such as our caramel apples & chocolate specialties. This entry was posted on Friday, October 5th, 2018 at 11:01 am. You can skip to the end and leave a response. Pinging is currently not allowed.